The families I support are often suffering from relationship issues, a general breakdown of the family unit, or domestic violence. Often hurt and pain creates walls that prevent family members from hearing and understanding each other. I take a family systems approach that often incorporates attachment theory, parenting and Gottman relationship skills. My practice works to empower and support each family member and help them recognize their strengths. As they do, they become more confident in negotiating change within their family. The voices of children and adolescents are particularly important. 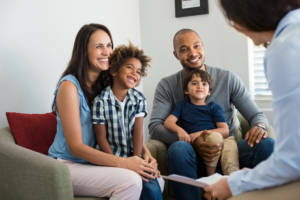 Parents learn to understand their role as leaders in the family unit and their responsibility to provide a safe, nurturing, and secure home environment. The needed skills include listening to, understanding, and validating their children’s needs and adapting an authoritative rather than an authoritarian approach. The goal is a respectful family setting where family members practice healthy communication skills. Under the guidance of caregivers, family members learn to negotiate their way according to their developmental capacity.